A canoe is a floating blind. You're there, but not there for the wildlife. They're much less afraid of a silent seated half-human in a little barque than they'd be of a walking whole human. You're sort of a water centaur, blending beautifully in. I was standing on the pier at Lakeside, Ohio, when a couple of local folks started up a conversation. A cormorant flew by. The man exclaimed, "I HATE those birds!" He launched a litany about how they "clean out all the fish" and "crap all over the islands and ruin them." I guess you don't eat fish or crap, either? But I didn't say that. Instead, I said, "Hmm. Lots of people say that. But they overwhelmingly eat fish that people aren't interested in. And yes, they crap a lot. Did you know they're actually small pelicans?" At this his wife piped up. "You love pelicans!" Which was sweet and helpful of her, and it gave me a silent inward chuckle. I thought somebody had to stick up for the cormorant, but I knew he wasn't going to change his view of them in one conversation on a pier sticking out into Lake Erie. Well, I, for one, like cormorants. 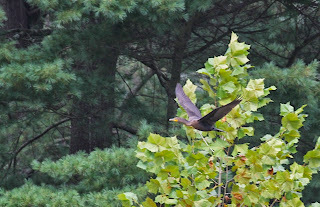 Especially when they fly gracefully against a white pine backdrop, which is not very often. 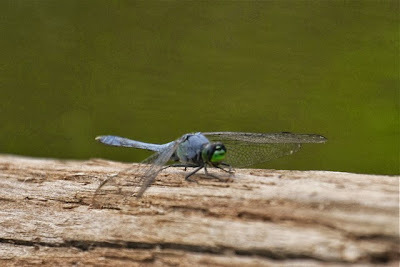 Eastern pondhawk, E. simplicicollis. I adore its cool slate-blue body and green face. It reminds me of a decomissioned World War II fighter jet, with the paint oxidized, sitting in some little midwestern town green, tethered and forever hovering on a tilt 10' over the clipped grass. 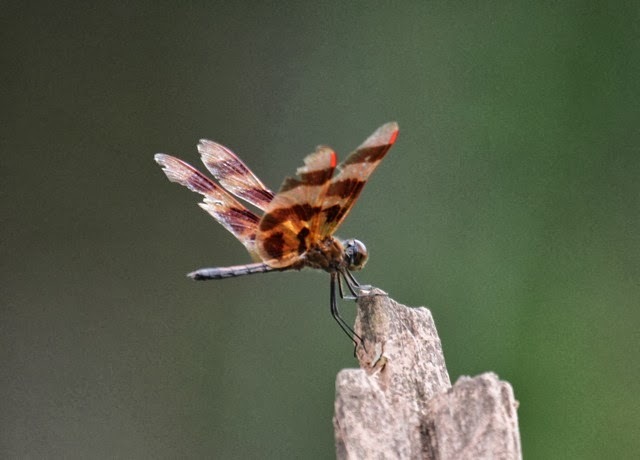 The snazzy Halloween pennant, Celithemis eponina. 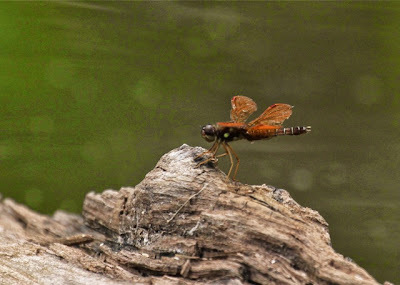 Just getting my feet wet in dragonflies. Could be wrong. Often wrong. 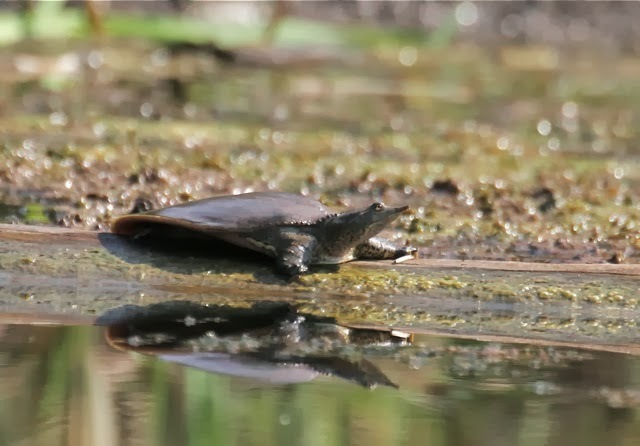 Eastern spiny softshell. Probably the coolest-looking turtle in Ohio. Spooky, too. I was happy to get a photo that showed its wary eye before it slipped backward into the drink. 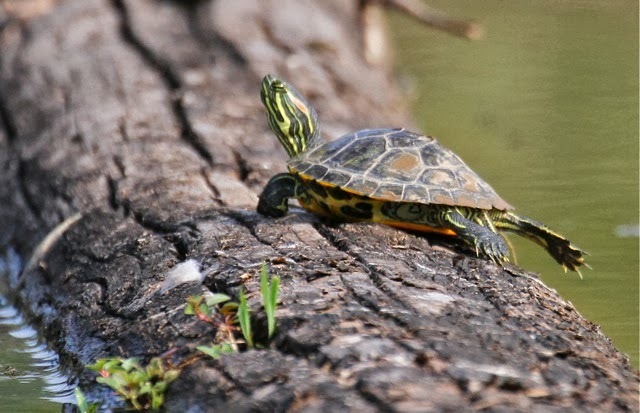 a gorgeous little red-eared slider, the only other turtle species I saw this day. You'd think it'd be lousy with painted turtles and mud turtles, but not today. And come to think of it I don't know that I've seen painted turtles here. Still thinking about that. 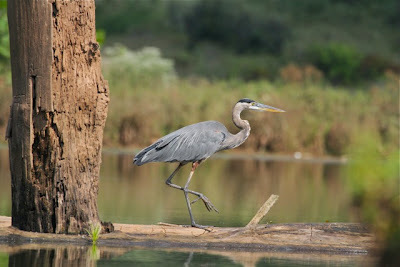 A great blue steps along a log, one of the snags I'm talking about that are in the process of falling down. Sigh. Would they could stand forever. But every time I canoe at North Bend, I work my way around more logs. You beautiful lanky thing you. I've always loved lanky. 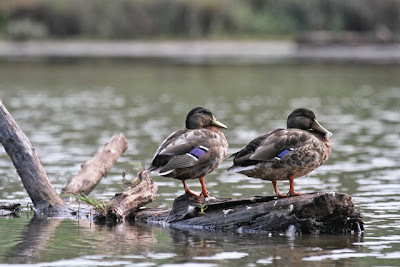 Two mallard drakes in eclipse plumage rest. Thank you for leaving your fabulous violet blue speculae out for me to admire. No matter what miserable molt mallards might be in, they keep that badge shining. Oh, you make me sooo paddlesick. I did just get to spend 8 days paddling in the Boundary Waters but I didn't bring my canoe with me, thinking there would be no places to paddle without a portage so didn't to paddle my usual several times a month. But I'll be living and working in Okefenokee NWR this fall and winter and will definitely be doing a lot of paddling. 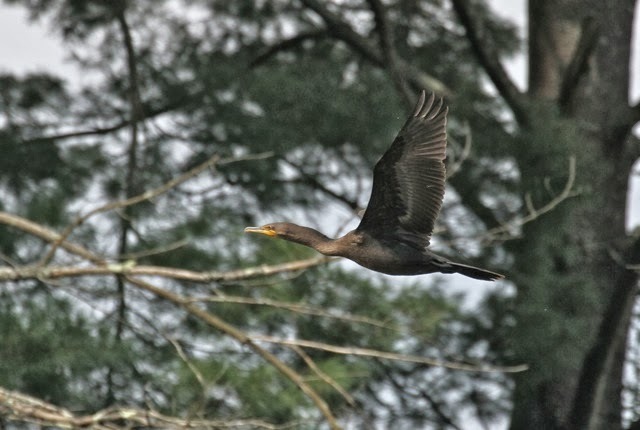 AND I expect to see hundreds of cormorants. That guy should NEVER come to a big Texas lake. He would have a cormorant-induced stroke. Sometimes the flocks there in the winter number in the thousands. Hard to like your little pelican when you have over 5000 of them in one spot. Peak number estimate on Rondeau Bay was well over 10,000 during staging. Nice seeing you and Bill at Lakeside. My younger son (lover of all creatures great and small) is working with a group that is doing work at Bombay Hook, under the direction of DNREC. Fixing deer blinds, cleaning out duck blinds, cutting grass etc. He's working with guys from Wilmington. City guys. Streetwise city guys. 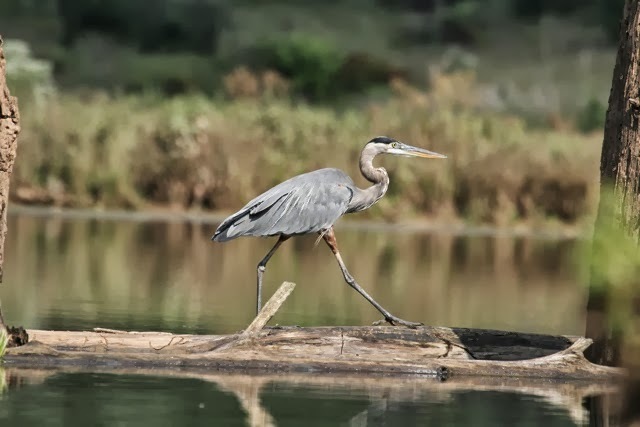 They were deathly afraid to put on waders and get in the water. "Are there alligators in here?" they kept asking my son. He is loving his role as the knowledgeable one. He assured them there are no gators anywhere in DE. They were bundling grass up and came across (sadly) a black snake that the big mower had gotten. The city guys freaked out. He assured them that not only was it dead, it was a snake that ate rodents and no danger to humans. He told them we have them living in our garage and he has a complete shed skin hanging in his room. Then they saw a turtle and freaked again. He looked and said 'Guys. That's a painted turtle. Not a snapper. It's not going to hurt you." These young toughs are scared to death of being in the swamp. Thank goodness I have a son who is not only not scared of these things but relishes them.